I always hear a lot of stories from friends who also collect pinball machines and other collectables.. very impressive stories about how they found something valueable or what they had to do to get it. I'm glad to now have some pictures to show you that at least one of these stories is true.. If you did interesting finds (with pictures) then let me know. A friend of a friend bought a house. It seems the previous owner worked for Coca-Cola. 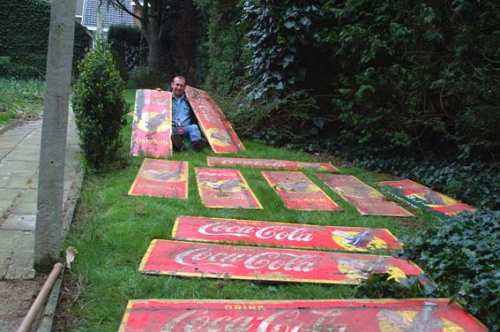 So when he had to make a new path in his garden, he used 'old' enamel advertising boards from Coca-Cola as they were available to him. 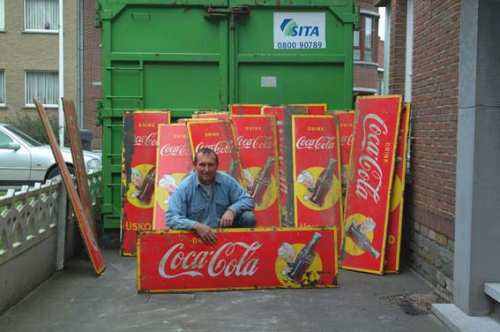 My friend realises they're valuable so they start to dig for a few hours, this is what they found: a lot of Coca Cola signs ! 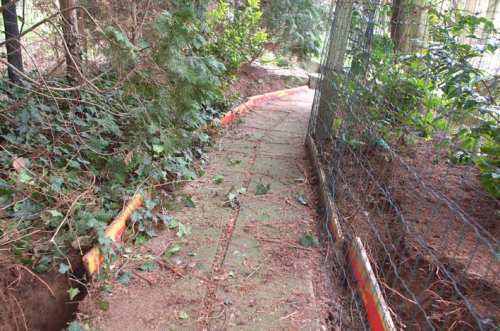 That's a nice garden path, isn't it ? But what is the border exactly made from ? Time to start digging ! Drink Coca-Cola ! 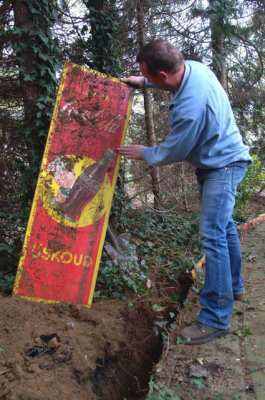 The enamel boards seem to be in relative good condition after being buried for 20 years or so..
Emailleries Belge (who made the signs) provided quality. The complete find: 16 enamel boards. Not bad ! Collectibles saved from going to the dumpster, that's the most important part of this story. Had the house been bought by someone else that was maybe where they would have ended..